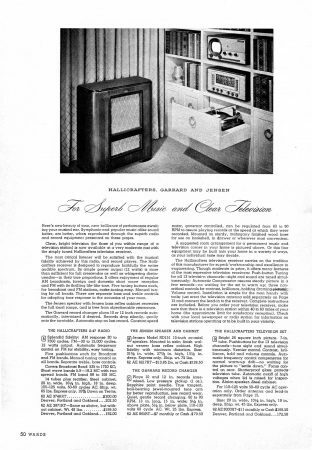 While there had been Hollywood moguls who installed film projectors in their living room since the 1920s, what we now call home theater needed television screens of some kind for the visual component, and that came as World War II ended. 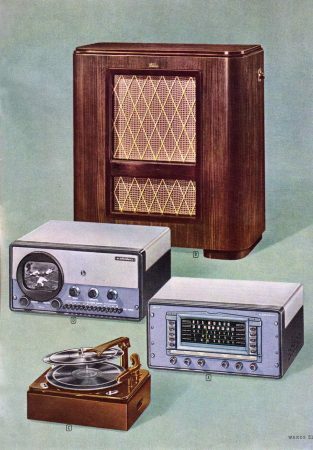 This Montgomery Wards specialty catalog from 1948 assembled the components then available — a television, a turntable, a radio receiver, and one big speaker — and placed them all on bookshelves to form a rudimentary home theater system. How rudimentary? The TV has to be considered the weak link in this “theater”, as the black-and-white picture tube only showed a 7 inch picture. That’s 7, not 70. They did promise to receive “all 13 channels” then available with pushbutton ease, including Channel 1 which was never actually put into use. That’s how new TV was. The catalog copy (worth zooming in to read) cautions the reader to be sure there actually was an operating television station within 40-60 miles of your home before ordering. Hallicrafters made both the television set and the radio receiver, which could receive the brand-new high fidelity FM broadcasts. Garrard of England built the turntable which played shellac 78s (the modern LP had not was several months away from being announced.) It was up to you to mount it in a drawer using your DIY skills. Jenson built the speaker. You only needed one, since stereo was still a decade away from public popularity. Hallicrafters and Garrard are no longer with us; Jenson still makes speakers. What about all those other things pictured on the shelves? Those are called books, and as television sets have grown larger and thinner, and the offerings have expanded from 13 channels to hundreds (plus on-demand streaming) we no longer have room or time for those.